Kelli wanted to get back down to attend the Night of Joy in the Magic Kingdom. These are two nights of Christian music held the weekend after Labor Day in early September. I am not into this type of music, but it is good enough to listen to and I was looking forward to the very low crowds at this time of year. We are planning a more relaxing vacation with no park storming and plenty of pool time. The last time we attended the Nights of Joy we stayed at Bay Lake Tower. 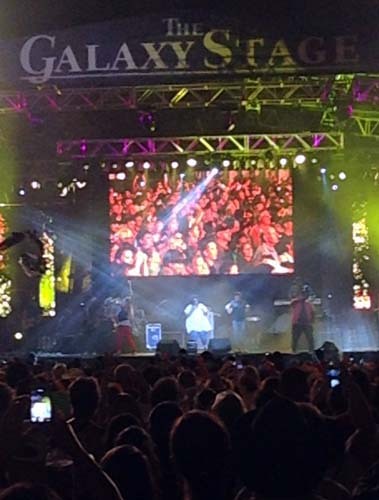 Kelli was looking forward to seeing a new performer, Mandisa, a former American Idol contestant, fifth season. 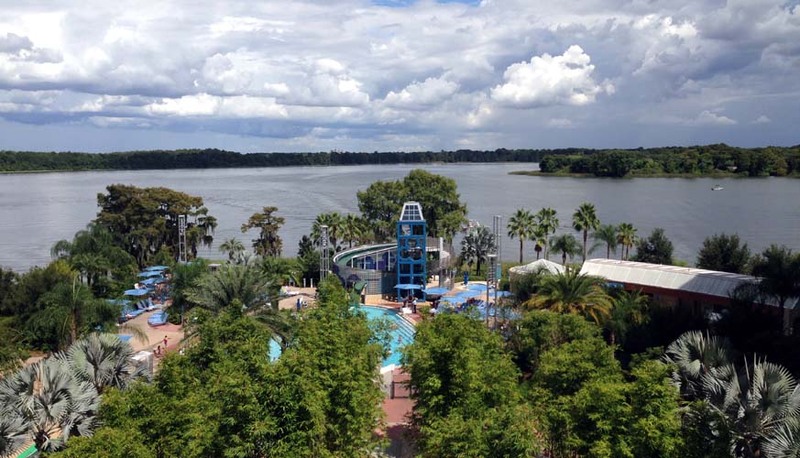 Bay Lake is a perfect location to attend this event. 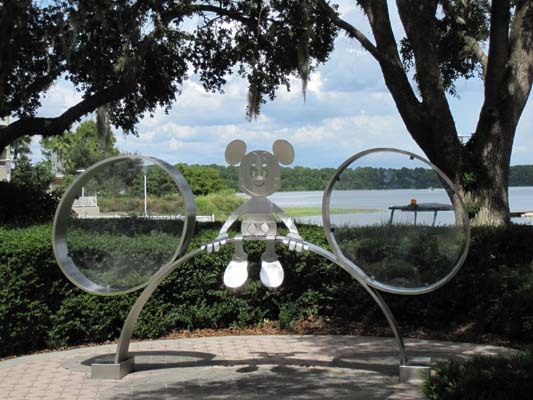 It is an easy walk to and from the Magic Kingdom. Kelli has taken swimming lessons and we love Epcot, so a visit to the Beach Club and Storm-a-long Bay was in order. That is where I decided to try and plan the perfect split stay. 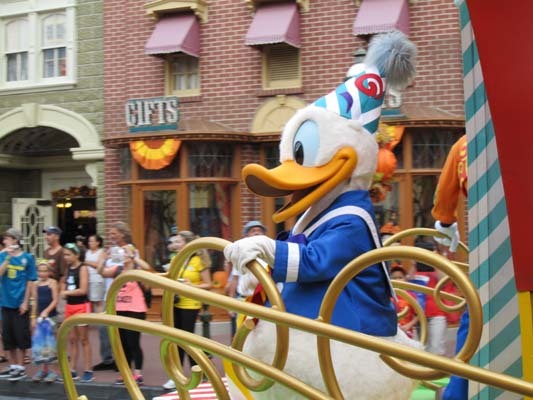 We will start with a Bay Lake studio and visit the Magic Kingdom and Animal Kingdom. 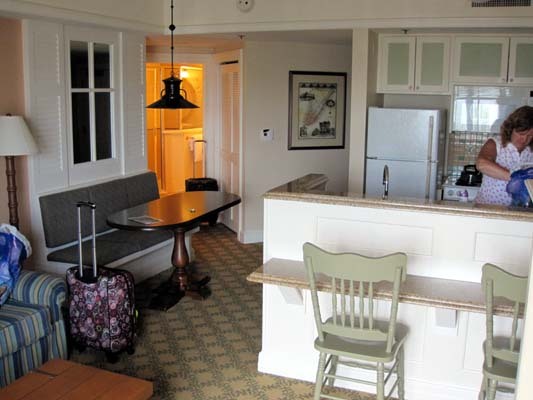 Then switch to a one bedroom at the Beach Club, where the washer and dryer, more space, whirlpool tub, and walking distance to both Epcot and Hollywood Studio will be welcomed. 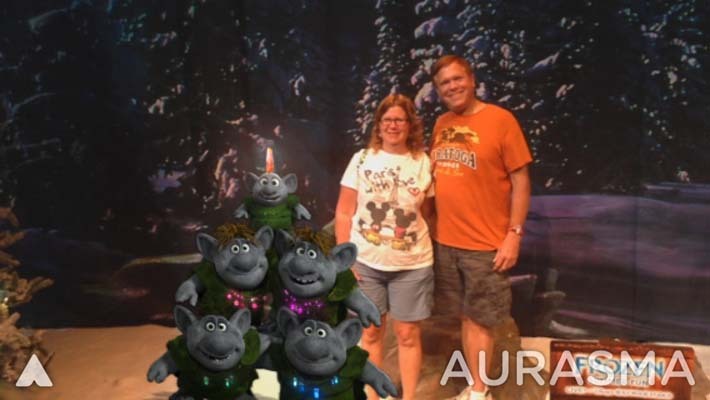 We made reservations for one of the After Hours Wind Down events at Epcot. 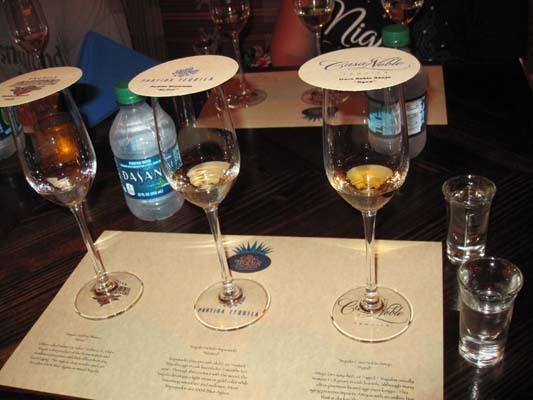 We will be tasting tequila on Sunday at La Cava del Tequila. We have a few Advance Dining Reservations, ADRs. We could only get Be Our Guest for 9 PM the day we arrive. After the Wave for breakfast Friday morning we will have dinner at 'Ohana on Friday and the Wave on Saturday, just before the Night of Joy events. After moving to the Beach Club on Sunday we have ADRs for Captain’s Grille for Breakfast and Yachtsman Steakhouse for dinner on Monday, Liberty Tree Tavern before attending Mickey's Not So Scary Halloween Party on Tuesday and our final dinner at Narcoossee's at the Grand Floridian Resort on Wednesday the night before heading home. We got up at our normal time so our brother-in-law Scott could drive us to JFK airport from Westchester County for our 9 AM flight on JetBlue Airlines. We are finding that this departure time works the best for us. It is not too early, so no short night’s sleep; but not too late so we can catch some park time later in the day. 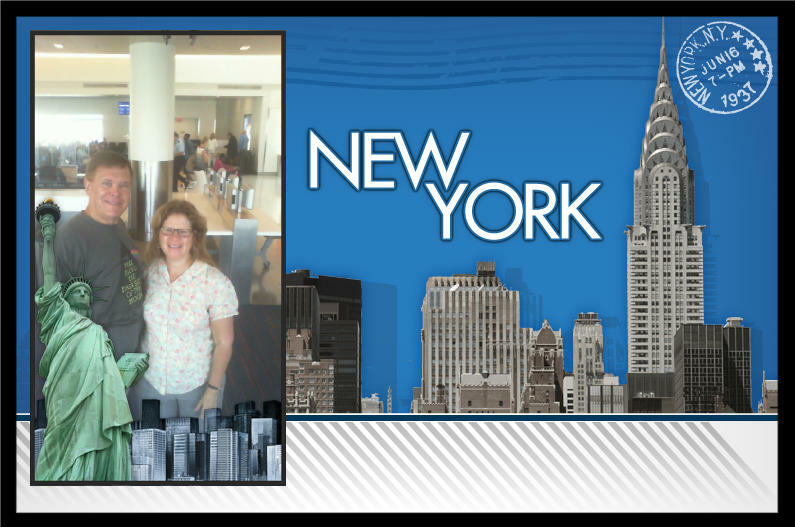 In the waiting area to board we found this kiosk where it will take your picture and send an e-postcard. We love JetBlue. No other airline comes close with their better legroom, inflight entertainment (TV) at every seat, no baggage fee, and extended carryon overhead bins. Each JetBlue plane has its own unique name and always has the word Blue in it. This plane was named Blue Really Got Me Goin’. It was a new plane in service for only a month. We took off on time and I watched the 2014 version of Godzilla. I was disappointed in the movie being a big original Godzilla fan. I even liked the Matthew Broderick version. Godzilla was minimized in the plot. This version spent its time featuring a pair of other monsters. We landed a little early, picked up our checked bag and headed to the Enterprise counter. Only two people were waiting on line. I noticed the automated kiosks were empty and I asked if I could use them. They said of course! Words of advice, if they have them, use them. Why wait on a line and deal with people trying to up sale you and waste your time. Once checked in all we had to do was walk across the street and have someone show us what cars to pick from. We were quickly on our way using the south exit. We stopped at Super Target off I-417 at Exit 11 for bottled water, soda, Lactaid milk, cereal and snacks. We prefer the quickness of a cereal breakfast at the villa while relaxing out on our balcony. I went the back way to Bay Lake avoiding the toll booths since our AP renewals were not activated yet. We parked in front and quickly checked in. We unloaded the car with all our luggage and groceries on a cart for bell services to bring up. Our room was ready. We had asked for a high floor and got room 7625. I was slightly disappointed at getting only the 6th floor. But it turned out to be dead center of the building with a perfect view of the pool and Bay Lake! It was an awesome view that we enjoyed throughout our stay. We parked the car, checked out the room and a knock on our door meant that our luggage was already here. 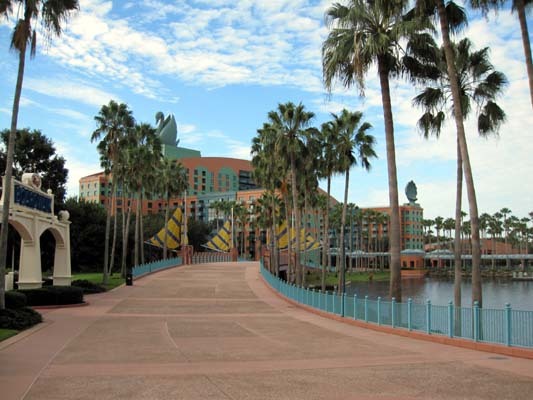 We were hungry so we walked over to the Contemporary using the fifth floor bridge and had lunch at the Contempo Café. We each had flatbread, Blackened Chicken for me and Caprese for Kelli. Both were excellent. 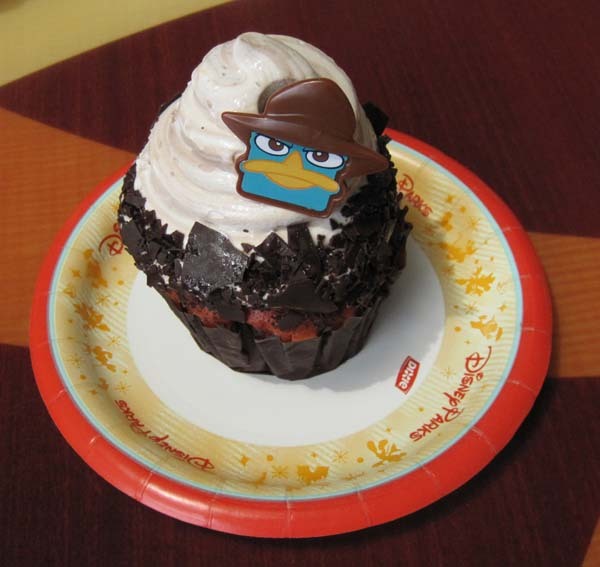 We split a chocolate cherry Agent P cupcake. Even got an Agent P ring, but it is so small it won’t even fit on my pinky finger. Young kids get all the good stuff! After unpacking a bit we walked over to the Magic Kingdom and activated our new annual passes and got our cards to use for discounts. 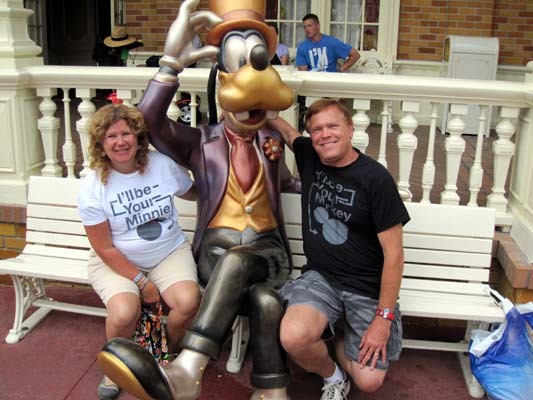 Our new Magicbands worked fine, but Kelli still has trouble with the finger print scanner. 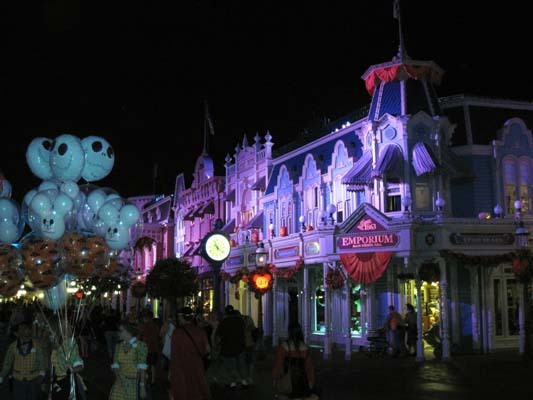 Some Halloween decorations were already up on Main Street and we made our way to the back. I knew we had missed our first FastPass Plus window for Under the Sea –Journey of the Little Mermaid but when I checked My Disney Experience App I found that they had replaced our next FastpassPlus for Enchanted Tales with Belle with a general FP that could be used at a number of attractions, one of which was for Mermaid. So we used this second Fastpass to ride Mermaid and then did the standby line for Enchanted Tales with Belle. We just missed the next group in so we had to wait a short while. Some people think you only do this attraction with small kids. NO, this will please young and old, with or without kids. 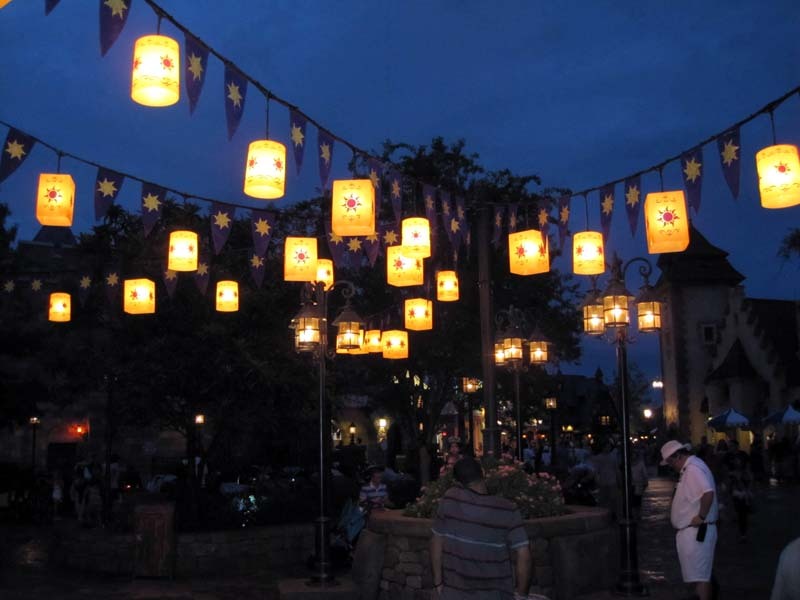 The portal is amazing, the animation of the Cupboard and Lumiere are extremely well done and the interaction of Belle with the audience may even bring a joyful tear to your eye. We did Peter Pan’s Flight next followed by Mickey’s PhiharMagic since this will be closing for refurbishment in a few days. 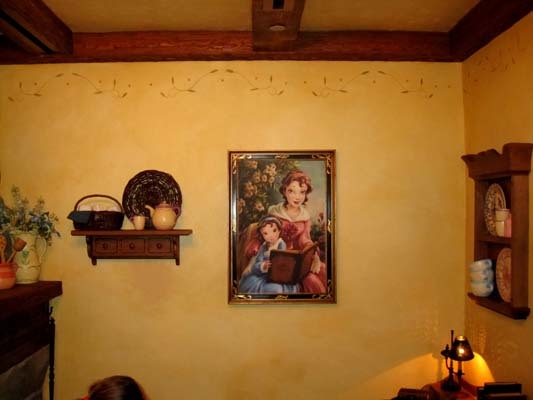 We stopped by the restrooms near Rapunzel’s Tower. 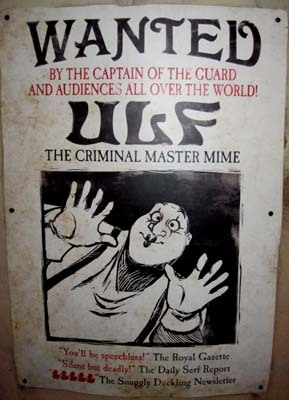 This is a beautiful area at night and the wanted posters based on the movie are worth a read. Next up was it’s a small world then The Many Adventures of Winnie the Pooh. We headed for a late dinner at Be Our Guest. We had to wait a bit but were then seated in the beautiful main dining room. 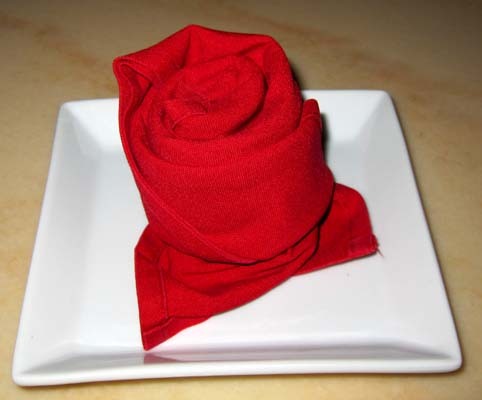 The red napkins folded into a rose were a nice touch. 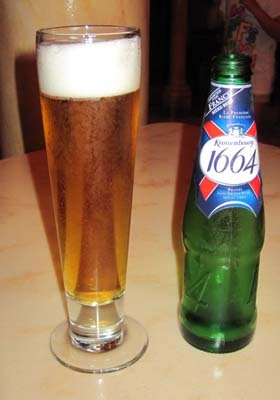 I ordered Kronenbourg 1664 beer and we split the French Onion Soup with Gruyère Cheese. It was good but I have had better. Our entrees were scrumptious. I had the Sautéed Shrimp and Scallops served in a Puff Pastry with a creamy Lobster Sauce and Kelli the Chicken Breast Provencal with olives, tomatoes and white wine and roasted fingerling potatoes. 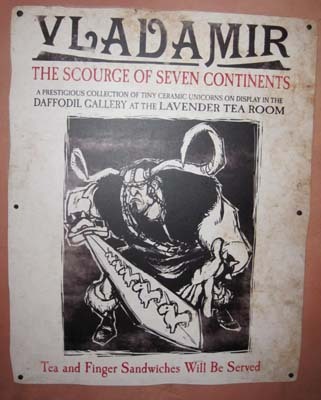 The Beast was seen heading back and forth to a room where guest can meet him as we enjoyed our dinner. Our waiter Sue brought over the dessert tray and we could not resist. I told Sue the dishes told me the Grey Stuff was delicious and ordered that. 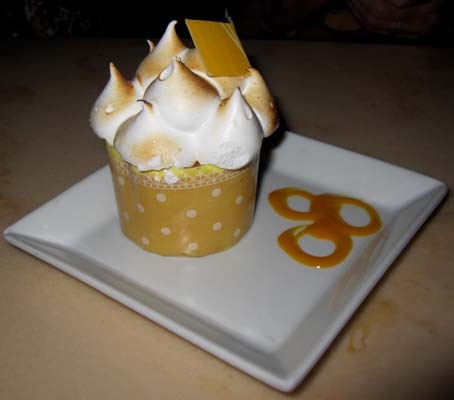 Kelli had the Lemon Meringue Cupcake. I really liked the Grey Stuff. 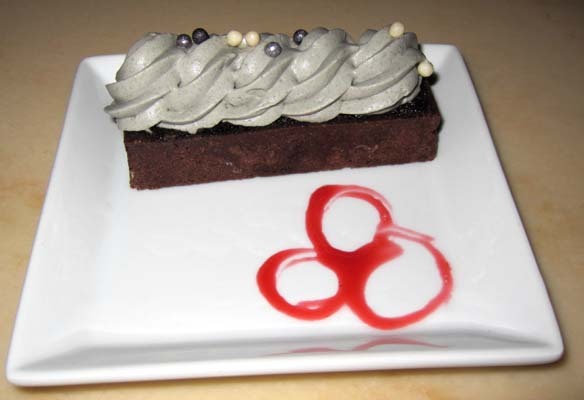 It is a Chocolate Shell with Cookie Crème topped with the Grey Stuff. Our Tables in Wonderland Card saved us $13.59 off the bill. With tip the meal cost us $70.14. 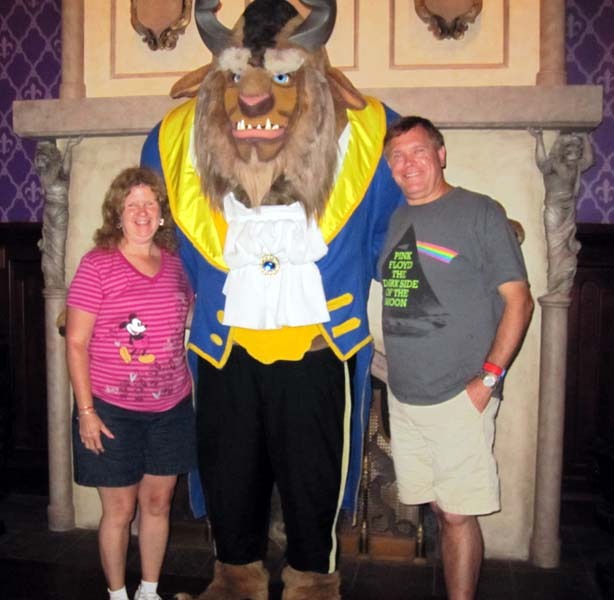 We took a picture with the Beast on the way out. The park was now closed and the CMs were very confused. We tried to make our way to Main Street via the castle but that was closed off. They told us to go left toward the Mad Tea Party but the CMs there had that blocked and said to turn back. We retraced our steps and tried the other way around towards Peter Pan and that was blocked off. People were getting very annoyed at the clueless CMs. There was no way out! 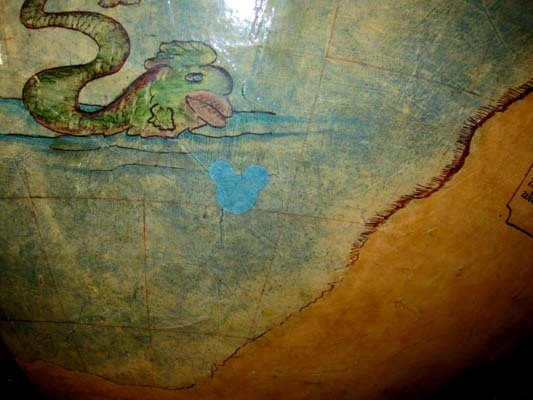 Eventually we had to retrace our steps AGAIN and went around the castle via the Mad Tea Party ride. After all that extra walking going nowhere it was nice not to have to stand and wait for a bus as we walked back to our room for a good night’s sleep. We woke up to a beautiful view of Bay Lake from our bed. After getting ready and enjoying coffee on the balcony, we headed down early for our 9:10 AM ADR to The Wave located in the Contemporary next door. We were 30 minutes early but were lead right in. We had read they have one of the best breakfasts in Walt Disney World so we wanted to see for ourselves. I was ready to order off the menu, but one look at the buffet changed my mind. This is a great place to have breakfast! Along with the expected breakfast fare the Wave also had eggs benedict, sweet potato pancakes, smoked salmon bar, steel cut oatmeal, and Wave’s version of grits with cheese and bacon. Everything was fresh and delicious. The eggs benedict were the best I have had with a great hollandaise sauce. We headed back to the room to get ready for the day and saw someone parasailing on the lake. That is something I want to do one day. We headed to Animal Kingdom by car. We were unlucky with our timing and had to park at the end of a row, so it was a long walk to the tram. 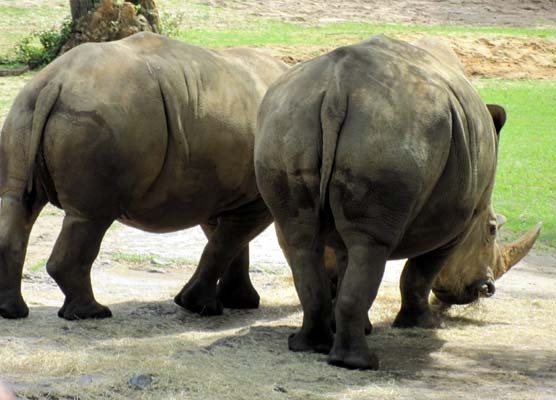 Once in the park we headed straight for Kilimanjaro Safaris using a fastpass. The animals were cooperative and I think we saw more giraffes then any of our previous safaris. There are now two species of giraffes here, Masai and Reticulated. Masai Giraffes are darker brown and have jagged-edged patches. Reticulated Giraffes are orange brown with very defined patches. Here is the end of our safari ride. 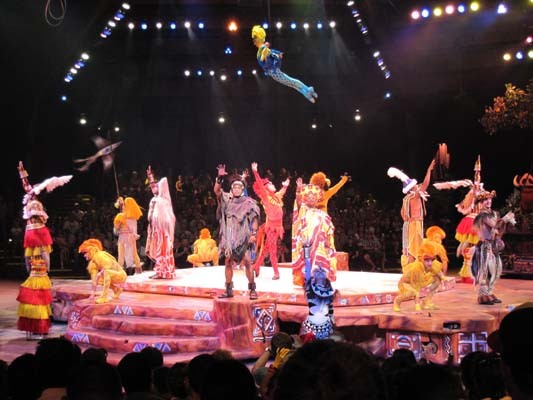 We were eager to see the new home for the Festival of the Lion King. 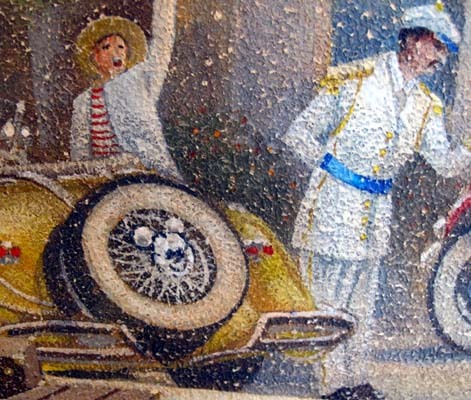 The Harambe Theatre is located behind the Dawa Bar and the Tusker House Restaurant. It was already hot today and the new queue did not have much shade. We almost bailed but stuck it out till the next show. Inside looks identical and the arrangement of the animal sections remain the same. Warthogs are on the immediate right, giraffes on the immediate left, lions far right, and elephants far left. The show was energetic as usual. This is a not to be missed show. Did I mention it was hot? Our plan for the day was simple. Do a couple of attractions then hit Kali River Rapids, get wet and head back to the resort to rest up for the Night of Joy. Once we arrived for the rapids we saw it only had a 10 minute wait. We used our fastpasses first in case that wait time was a mistake. We were quickly on a raft and the rapids seemed faster. I suspected the water level was a little higher than normal. My theory was bolstered by the drop. Usually only two people in the raft get inundated by water. Not this time. Eight of us got soaked to the bones. It was a great ride. We got right back on the standby line and got soaked again. The wait for the third ride was a little longer, and it had started to rain. We were worried that lightening could close the ride before we got on. But that never happened. We were again soaked and loved every minute of it! 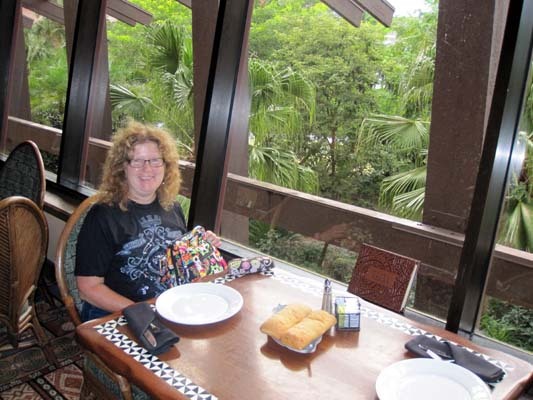 We made our way over to the Flame Tree Barbeque for a light lunch before heading out. We relaxed on the balcony in the afternoon before getting ready to head for 'Ohana and the Night of Joy. 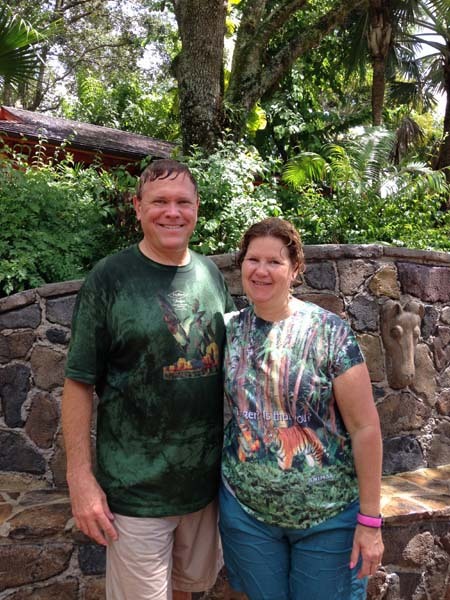 We made our way over to Disney's Polynesian Village Resort by monorail. The “Village” in the resort’s name had just been added. Victorious from Queens check us in; yes that was his name. Kelii remembered him from eating a Kona a couple of trips ago. 'Ohana was not opened yet and we had to wait with a lot of other guests. That gave me the opportunity to order a Piña CoLAVA , a Pina Colada with raspberry puree from the Tambu Lounge. There was a little ceremony to open the restaurant. About half of the wait staff seemed disinterested in participating. We were seated quickly and had an excellent server named Cathy. 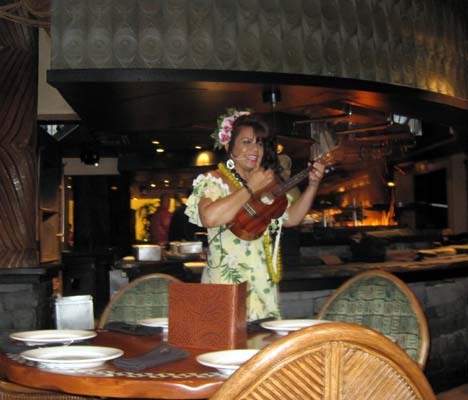 'Ohana is Buffet/Family Style and we realized some of the items might not be great for Kelli. She has intolerance for raw carrots, honey, sunflower seeds and almonds. Cathy brought out one of the chefs and he explained what things she needed to avoid. That left out the new lettuce wraps and the honey-coriander chicken wings appetizers, but the pork dumplings with garlic-ginger sauce was fine. I felt a little guilty eating the wraps as they were great. But Kelli did not miss anything on the wings. They were a disappointment with rubbery skin. We like them crispy. The pork loin, steak, and shrimp were ok but were well-done, which is typical with skewer type meals. Kelli likes her meat medium rare and I medium so that was another disappointment. The music and the children activities during dinner was fun to watch. Dessert was ‘Ohana bread pudding à la mode with bananas-caramel sauce. I liked it, but Kelli is not a banana fan. The bill with the Tables in Wonderland card discount, plus a bit extra over the 18% tip was $96.21. the cost without the card plus a regular tip would have been $118. In the end we won’t be back again. ‘Ohana for us was just OK. Too much food for us and too many things Kelli had to avoid, plus the rubbery chicken and overdone meat. But I was very glad I tried it. This can still be a great restaurant for many people. We had time to stop back at the room and walk over at 7 PM for the Night of Joy. One thing I noticed is that they were using the exit towards the resort buses as an entrance, since many people were leaving due to the early closing of the Magic Kingdom. They exited towards the ferry and monorail. The Night of Joy is a hard ticket event. You need a separate ticket for it. We entered and got our bracelets, which indicates you paid for the event and are not ushered out of the park by cast members. We hit one of the stands selling souvenirs for the event. Kelli brought a shirt and I brought her a cap. 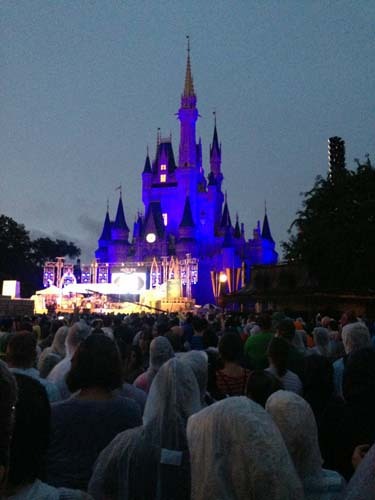 We then waited in front of the castle for the first performer, Matthew West. One thing that we noticed different from 2012, the hub was much more crowded. I think it was due to the construction going on. When Matthew West started his last song we headed for the Rockettower Plaza Stage in Tomorrowland to hear the end of Matt Maher. The crowd here was smaller so we were able to get much closer to this stage. When he finished we moved back to the Castle Forecourt Stage for Chris Tomlin. 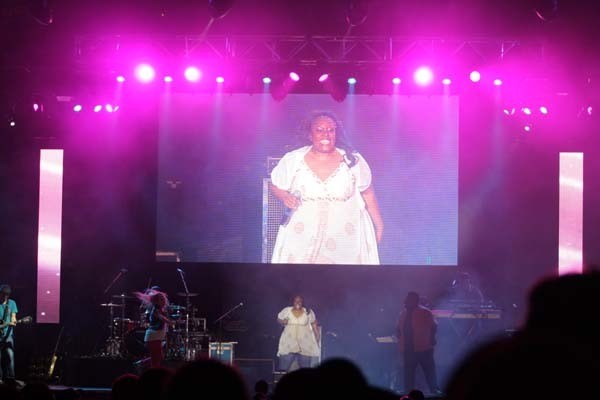 Although Kelli enjoys his songs, she wanted to see Mandisa as well but their performances overlapped. After hearing many of the songs Kelli wanted to hear, but before Chris ended, we headed over to the Galaxy Stage for Mandisa. This is back stage between the Carousel of Progress and Buzz lightyear. There was a long line to get in. We got in line and it stopped and moved. Mandisa started her performance but we could hear her outside on the line. We were let in as she started singing a song that Kelli was anxious to hear. Mandisa was an energetic performer and the dancers around her were good. She had some negative comments about how Simon Cowell treated her on American Idol. When she finished we quickly left to beat most of the crowd to the Castle Forecourt Stage for Hillsong United. We were able to get a little closer to the stage. Standing all this time made my legs ache but it was worth it to keep my Kelli happy. Again we were very glad to only have a short walk to our room. 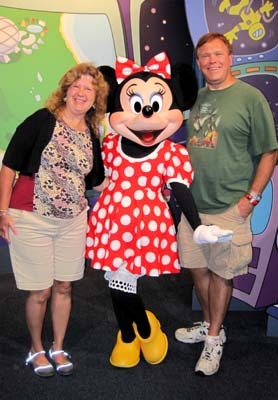 We slept in, no alarm clock, rare on Disney vacations. It was wonderful. We slowly rose, made coffee and had a breakfast of cereal and toasted English muffins and jam out on the balcony. This will be a relaxing pool day. We were getting hungry and wanted to try some of the poolside drinks available at the Cove Bar. 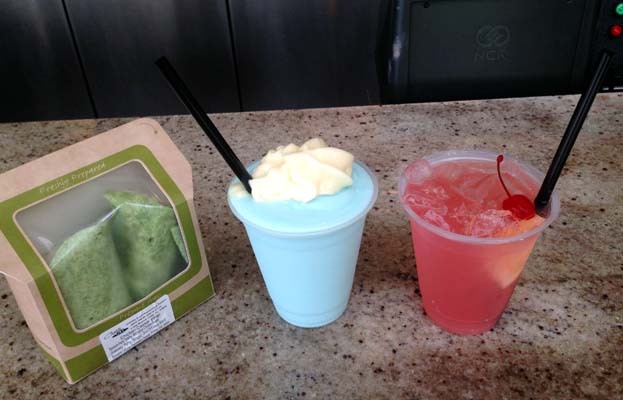 We ordered the BLT and chicken Caesar wraps along with a Black Cherry Lemonade - vodka, lemonade, lime juice, grenadine with sprite and a Moscato Colada - grape vodka, blue curacao, pina colada mix with passion fruit-mango foam. Both drinks were delicious and the wraps were good and filling. Cost was $40.38 with tip. We cooled down in the pool some more and got some sun. We watched the games the cast members did for the kids. In one game an assortment of different rubber ducks were thrown into the pool. On go, the kids ran into the pool and collected as many ducks as they could. Whoever had a particular duck, the only blue one, or the one that looked like a fireman won a prize. Clouds had rolled in, the pool got noisier and crowded, and so we headed in. I first did a quick tour of the Contemporary grounds and took a few pictures. It was now hot again. We relaxed and read on the balcony when Kelli noticed all the vultures from the Island got up and were circling just over the tower. The wind had picked up. Before long it started to rain, then downpour with a nasty swirling wind. We love watching storms come through but had to move indoors when it got real bad. The show was over before long and it was time to get ready for dinner. We had a 5:15 PM ADR for the Wave, one of our new favorite restaurants in Disney. Do not let the limited menu fool you. Each dish is wonderfully done. Lola was our server. We started with drinks, a Chocolate Martini and a Forever Young - vodka, cedilla, acai liqueur, blueberries, agave nectar, and lemon juice. We split a wonderful Seasonal Florida Peach Salad - pecan praline, greens, dried cranberries, warm bacon vinaigrette and truffle goat cheese. Kelli had the Beef Tenderloin and I the Lobster Ravioli, with Clams and Shrimp. We finished off by sharing the American Flavors Trio dessert. It was another great dinner. Cost with the TinW card was $97.48. We freshened up in our room then walked over to the Magic Kingdom. The exiting crowds were heavier so we moved up Main Street through the stores. MercyMe came on at 7:40 PM and did a little over an hour performance. That gave us another hour till Casting Crowns came on so we walked to the Galaxy Stage where Colton Dixon was playing and listened to one song. We tried to see the end of 1 Girl nation but the line to get in was too long. We had time so we did Buzz Lightyear’s Space Ranger Spin with a ten minute wait. 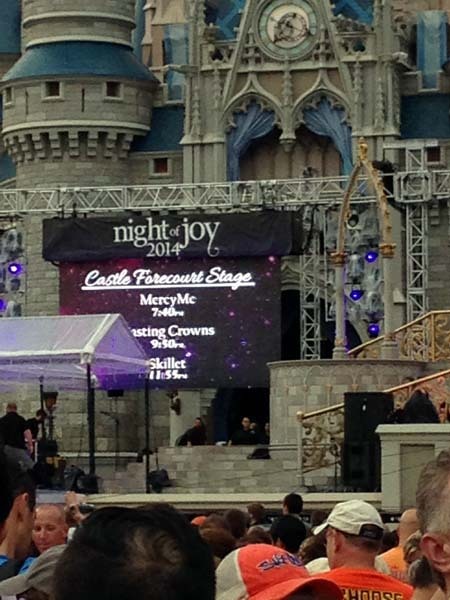 We then headed back to the Castle Forecourt Stage for Casting Crowns. The crowd had not formed and we got a little closer. Casting Crowns music is a little slow for me so Kelli let me loose to explore. I always wondered if it was a different crowd from the people that listen to the performers vs. the crowd that ride the rides at this event. I headed off to Adventureland. The walkways in Adventureland were not crowded at all. The people here were different. It was mainly youth groups with their chaperones, mostly early to mid-teens. I went on Pirates of the Caribbean and sat in the next to last row by myself with the rest of the boat one large youth group. The last row of the boats is no longer used due to some recent finger pinching accidents. That will teach you to keep your hands inside the boat. The group was a bit loud and some boys in the front of the boat waved their hands to mess up the projected image of Blackbeard on the fog part. 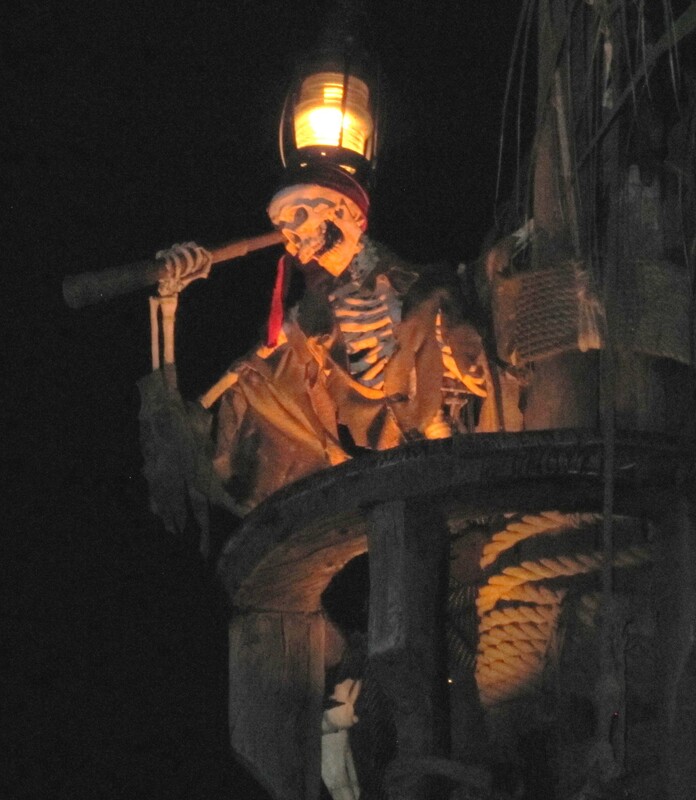 It did not bother me but I could see someone being annoyed if that was their only ride on Pirates and missed out on one of the effects. 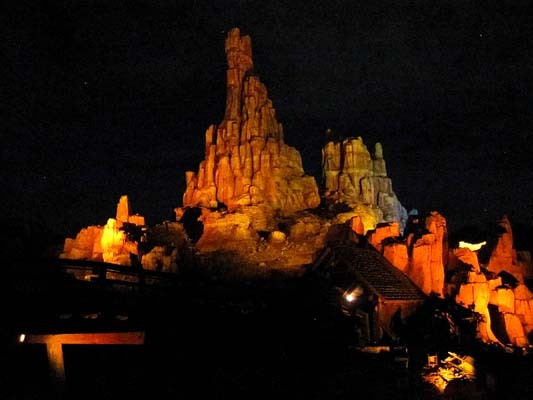 I made my way over to Frontierland and took some night pictures of Thunder Mountain. I helped a lost couple find their way back to the castle. 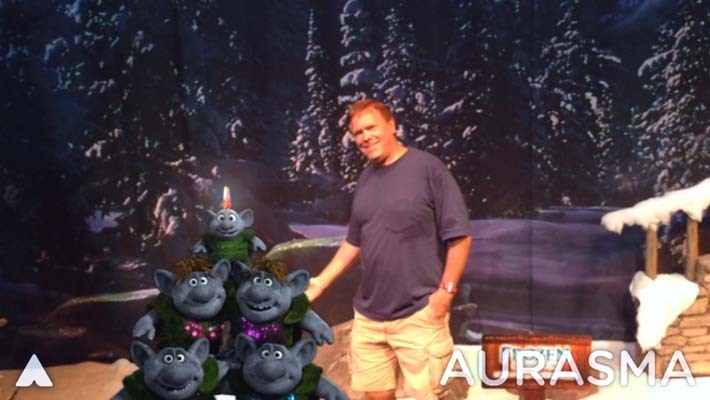 The Country Bears had just let out so I went in for the next show. We only had about 20 people in the theater. They were newbies about 20 years old and they seemed to get a kick out of the show. 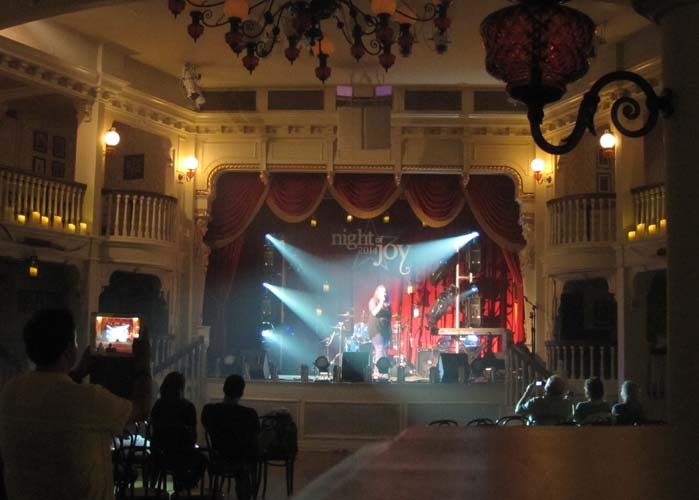 I stopped at the Talent Spotlight Stage inside the Diamond Horseshoe, where local performers can sing a few songs as part of the Night of Joy. It was a small crowd of 15. I listened to one lady finish and the first song from a girl. Both had wonderful voices. I wish I had found this earlier. I have no musical talent but I appreciate people with that talent. One can sit and listen to some great voices. It was time to find Kelli if I could. I made my way back to the hub but could only get so close to where I left Kelli. I listened to the last couple of songs and looked for Kelli but could not. Fortunately we had made a plan earlier that if we could not find each other we would meet outside Casey’s Corner. And that is where I found her, but not before texting her only to find her 12 feet away on the other side of the tree out front. Kelli enjoyed Casting Crowns but we were both too tired to hang out for Skillet who closed the event. 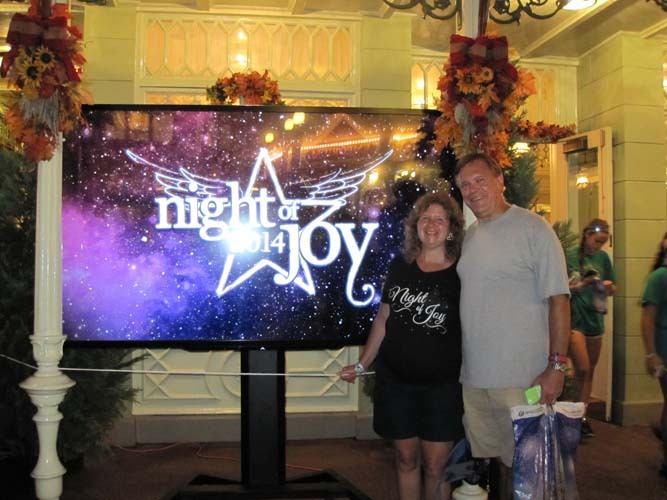 We took a picture in one of the glowing Night of Joy displays on Main Street and headed back to our room. Along the path back to Bay Lake there was a large puddle of water in the grass from recent rain. A chorus of frogs were singing from it. I t was a lot of standing. I am still looking for shoes that will not leave my feet achy. We brought snacks with us and raingear. It was a great two nights of Christian Music. I highly recommend if this is your passion. Today we are changing resorts and visiting friends on the coast. Tonight we have the much anticipated tequila tasting event at Epcot. It was a good thing we headed back to the room a little early. We had pre-packed the night before but still had to get up a little early to finish. We dragged everything to the car and checked out. This is important to do if you are changing resorts. It prevents problems checking in at the next resort since Disney’s computer system does not like you being at two places at once. We drove over to the Beach Club Resort and checked in. They were able to find us a one bedroom villa that was ready and met our requests, high floor with a balcony. A balcony is a must have for us. We had room 538. Just as in Bay Lake we were dead center of the building overlooking the pool. 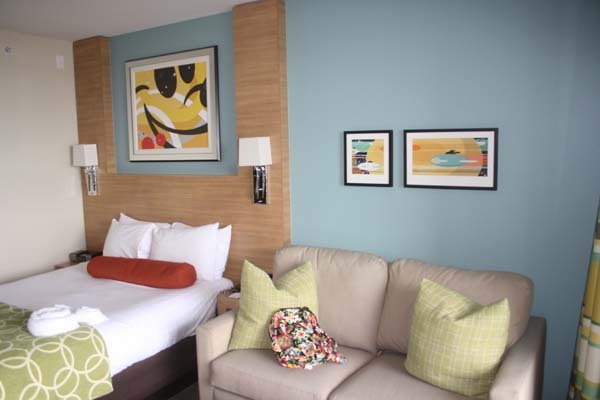 We love staying in a one bedroom villa, but almost always stay in a studio to save on points. This is a nice treat. The two sinks make it easy to get ready in the morning. Two TVs let each of us watch what we want to watch. And the whirlpool tub is great after a tiring day. We got ready for our day trip to Melbourne to visit friends. On the way out we noticed turtles and fish in the water heading to the parking lot. It reminded us of staying in Pop Century where they would congregate at the Century Bridge looking for people to feed them. We made a note to stop here again and get some pictures. We had a wonderful time with our friends. It was tough saying goodbye to them since we see them only once a year or less. We made good time getting back to the resort by evening. We again stopped at the Super Target off I-417 at Exit 11 for more English muffins, soda, snacks, but added butter and bacon since we now have a full kitchen. 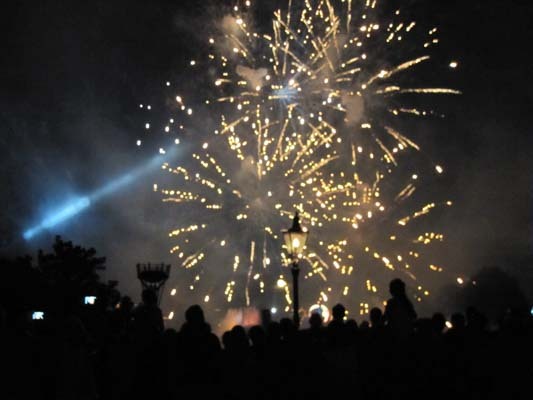 We freshened up in the room then headed over to Epcot for IllumiNations: Reflections of Earth. We watched from the bridge next to Mexico. 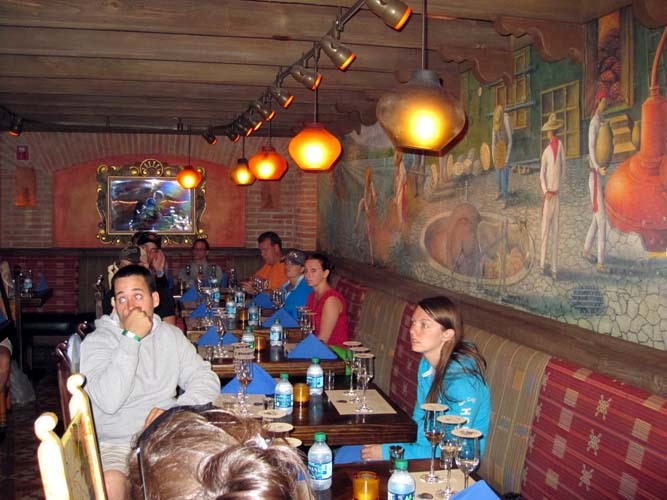 We then had to find out where to go for our Epcot After Hours Wind Down at La Cava del Tequila. We finally figured out we had to go to the side handicap entrance of the pyramid to get in. 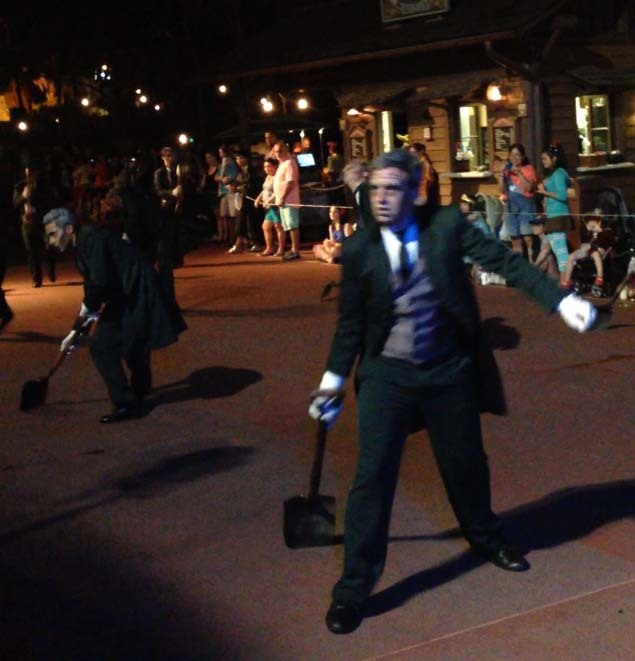 Epcot After Hours Wind Down are new events, with a $35 price, that requires a reservation. Following Illuminations a few lounges around World Showplace remain open. 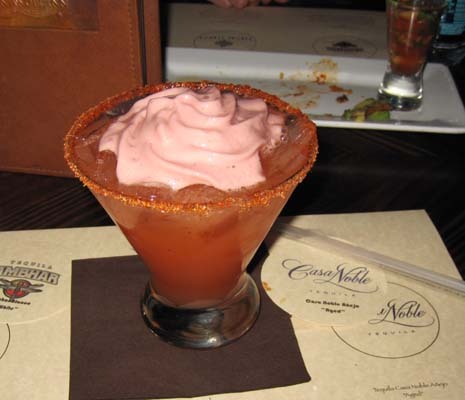 We chose La Cava del Tequila a lounge with over 200 tequilas, top-shelf cocktails, Mexican beer and wine. 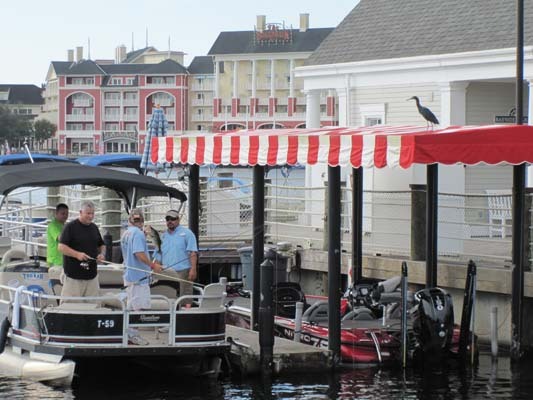 Anyone can stop in for a drink during regular Epcot Showcase hours. We were seated next to a couple from California. We had a great time with them. Our hostess then welcomed us and gave a presentation on how tequila is made. 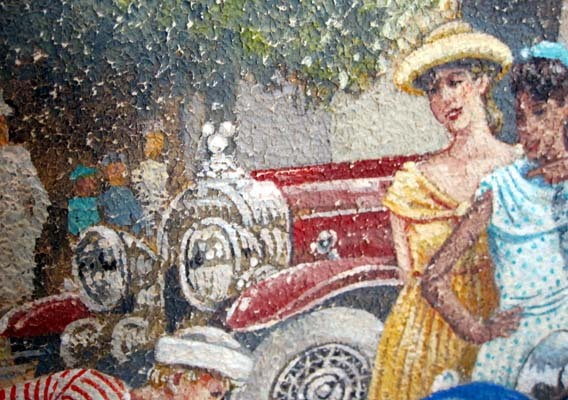 The giant mural in the lounge depicts the process. She then explained the different types, how to tell them apart, what to look for on the label, and the proper way to drink them. She strongly recommended ones that state on the bottle - made from 100% agave. Bottles simply saying it is made with agave only have to contain 51% agave. The corn syrup and other ingredients is what gives you that nasty hangover from massed produced tequila. In front of each of us was a half shot of vodka, a flight of three tequilas, a shot a Mezcal Sombra Blanco and appetizers, Chicken Tostada, Pork Tostada, and a glass of La Cava's Acapulco-style shrimp cocktail. The vodka was used to clear your pallet to properly taste the differences. She talked us through sampling each tequila as we sniffed and properly drank each one. Tequila Ambhar Blanco or "White or silver". Little barrel aging. Tequila Partida Reposado or "rested or gold". Smoother since it is aged 2 to 12 months. Tequila Casa Noble Anejo or "Aged”. Smoothest, aged 1-3 years in an oak barrel. The differences were amazing. The anejo was incredible smooth, had little alcohol fumes and smelled of chocolate and spices, which comes from barrel aging. We were now free to enjoy our appetizers, try the mescal if we wish and order from the bar. Each appetizer was fantastic. The shrimp cocktail had quite a spicy kick to it. The mescal was not as bad as I thought; very smoky aroma and flavor. Mescal and tequila are not the same. Tequila is only made from the blue agave plant. Mescal can be made from a variety of 30 different agave and other plants. The process is different as well. We ordered a Blood Orange Margarita to share - Tequila, orange liqueur, blood orange juice, and wild berry foam with a Tajin Chilli powder rim. Best margarita we ever had. We stayed for quite a while; enjoyed the company of our new friends from the west coast. Total cost with a good tip was $105. The cool part of the experience was walking through a completely empty Epcot. It was spooky but picturesque. I had a good buzz on. It was a good thing we could walk to our room. We set the alarm but were up just before it went off. We have a 7:45 AM ADR at Captain's Grille for breakfast. 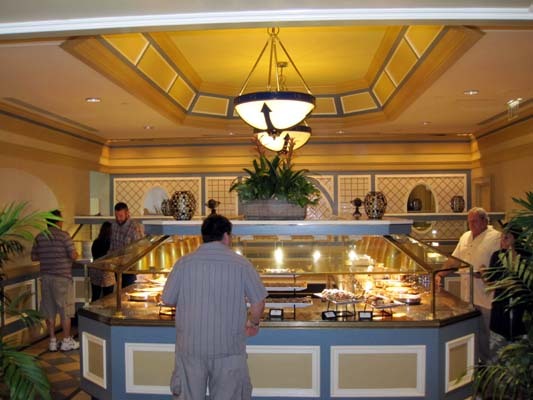 We heard this is also a good breakfast buffet and this one also did not disappoint. The buffet seemed small at first but there was enough variety of quality food to enjoy. Captain’s Grille features Chef's Frittata, which I describe as something between an omelet and a quiche. They were good but very filling. The Dark Chocolate Waffles were also a hit. Today was an Epcot day. There was no need to rush and make rope drop as we had a fasspass for Soarin’. We got top row but to the left. It seems we tend to get far right more often so the ride was a little fresher with a slightly different point of view. You are right next to the rock cliff in the hang gliding scene. Living with the Land had no line and had a boat with only 5 other people. 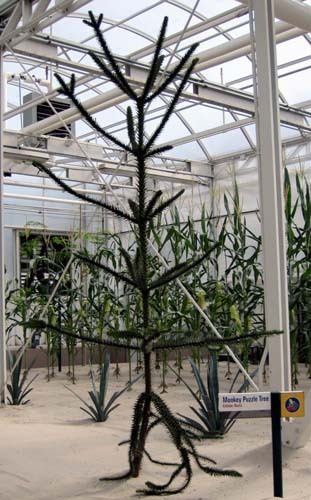 This was the first time I noticed the Monkey Puzzle Tree. 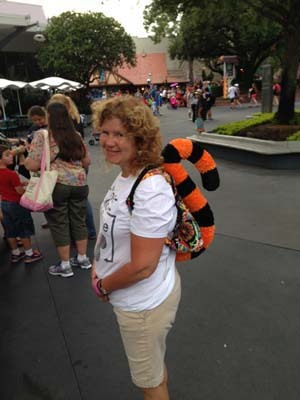 Kelli wanted to do Figment. 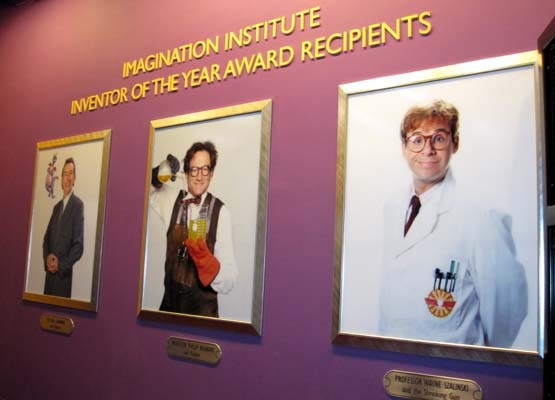 As we entered the queue, Kelli pointed to the right, where the three famed scientist portraits hang; Dr. Channing, Dr. Wayne Szalinski (Rick Moranis from Honey, I Shrunk the Kids) and Dr. Brainard (Robin Williams from Flubber). That is when we stopped and paid our respect to a great comedian. Robin Williams had just died a month ago. 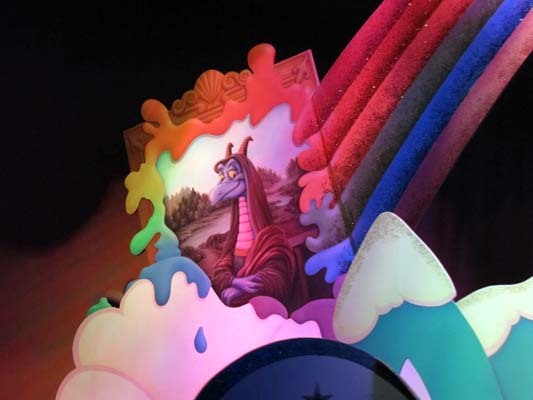 We enjoyed Figment and his antics. The post ride area was empty and we tried to send another Figment e-postcard but the keyboard had buttons not working to type in an address so we gave up. A few of the other kiosks were completely down. Time for some refurbishment here! 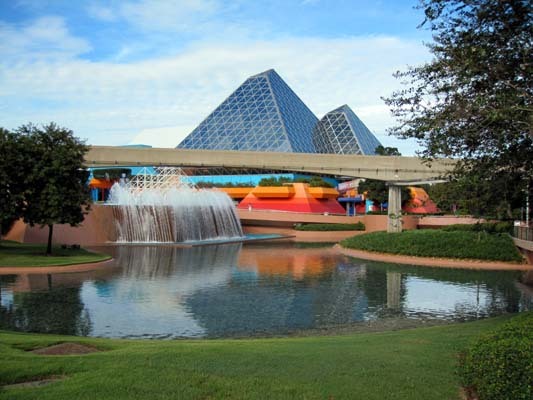 We crossed over Future World West to the Seas Pavilion and rode The Seas with Nemo & Friends. We then went in for the next Turtle Talk with Crush. We enjoyed watching the huge Moray Eels and the jellyfish in the waiting area. We had made a FastPass Plus for Crush in the early afternoon so I switched the Fastpass for the Maelstrom later using the My Disney Experience app on my phone. 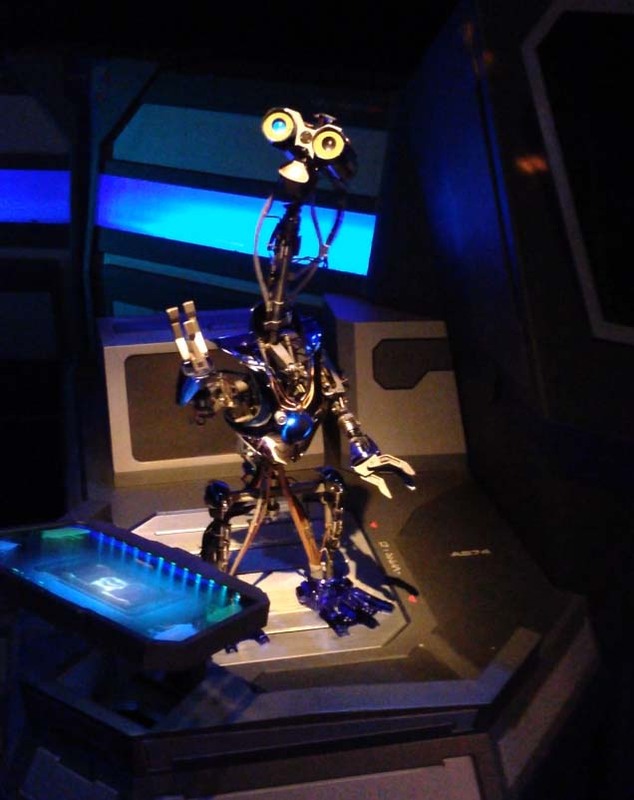 I am becoming a FastPass Plus fan. Crush’s voice was a little off but it was still a good performance. We had a fastpass for Epcot Character Spot and headed over there. 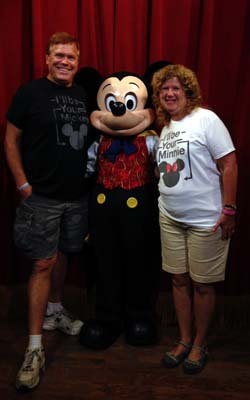 We still had to wait 15 or so minutes but then met and took pictures with Mickey, Goofy, and Minnie. We were hungry so we backtracked to the land pavilion for lunch in Sunshine Season. Kelli had the Sweet and Sour Chicken and I the Spicy Thai Green Curry Shrimp. Kelli loved her chicken. The curry had a great kick to it and I made a mental note, now written here, to have this again. 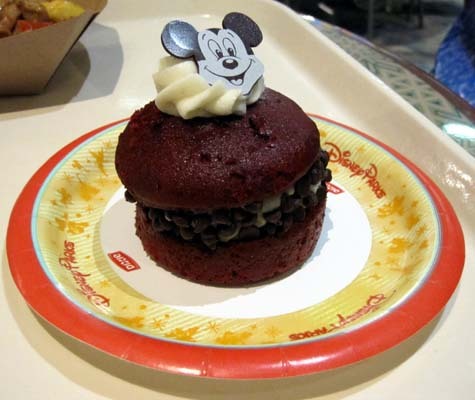 We split a delicious Red velvet Mickey whoopee pie covered in chocolate chips. 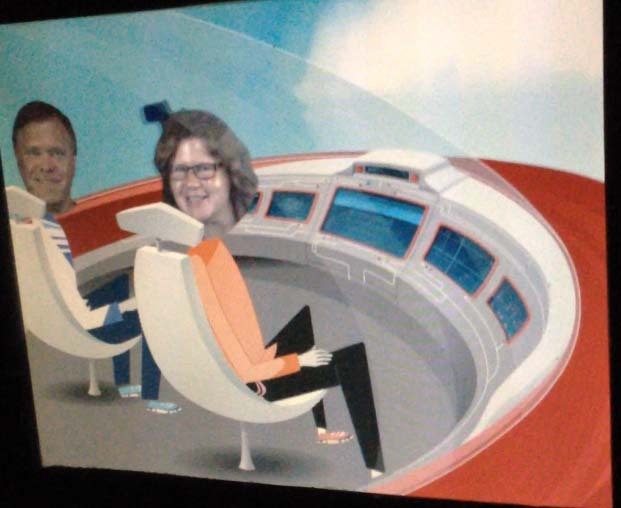 Next up was Spaceship Earth. In the video at the end of the ride, Kelli's head had this L shaped thing coming out of her head. It reminded me of a Dalek Puppet (from Dr Who). 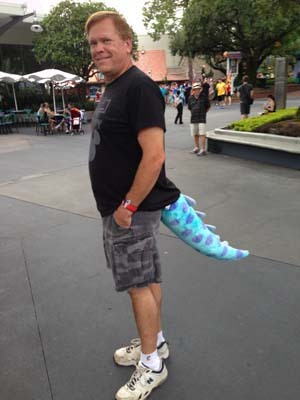 We then shopped in the huge MouseGear store and found a Tigger and a Sulley tails to use for the Halloween party tomorrow. We were anxious to get to Storm-a-long Bay so we skipped Maelstrom. We had ridden it in April and Kelli was not up for the drop. We heard it closed down for a makeover a few weeks later. I did not mind missing one last ride. 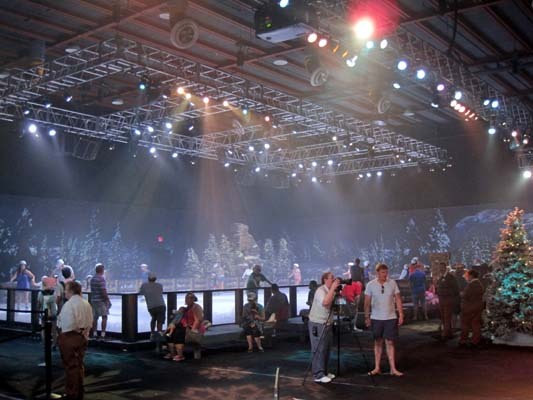 I was never a big fan but I look forward to seeing it made into a Frozen ride. We got back to the resort and quickly changed into our swimsuits. The last time Kelli was here she could not swim confidently and was timid of any deep water. With swimming lessons at a nearby high school she is becoming a better swimmer than me. We headed down for an afternoon in the pool. We explored just about every inch of this pool complex. We did the lazy river with tubes; the river is actually just a circle, but does go over 7 feet in depth. I did the slide a few times. Eventually it was time to leave and get ready for dinner, which was right next door at the Yachtman Steakhouse. We walked on over and were seated right away. We sat in a little alcove off the main dining room. It was the perfect place for a great quiet meal. We had a fantastic waiter named David. He brought out some bread and with some awesome roasted garlic. We resisted ordering appetizers. We did not want to over eat. Kelli had the Prime Rib with sweet potato casserole and horseradish cream and I the New York Strip with a white cheddar twice-baked potato and peppercorn-brandy sauce. The meals were so good that there was nothing left on our plates. We remarked that we need to find a good steakhouse near home. 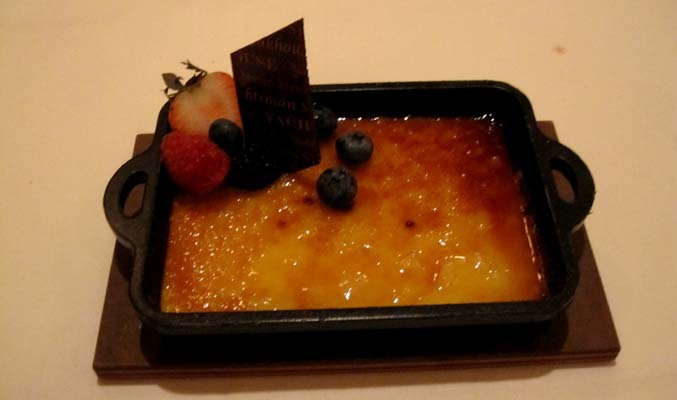 We finished the meal with the Crème Brûlée and the Chocolate – Peanut cake with pretzels and salted caramel gelato. Bill was $125.89 with tip and TinW card discount. After dining we visited the Yacht Club’s store Fittings & Fairings and explored the lobby. 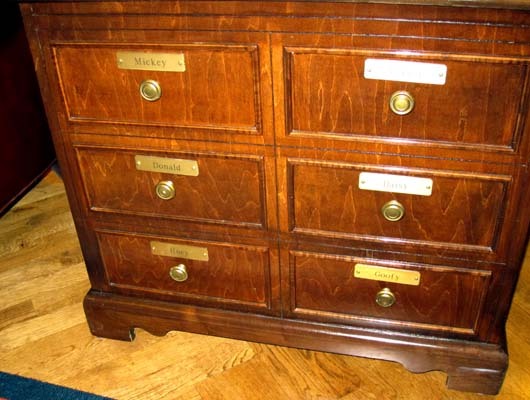 Using my Hidden Mickey app on my phone we looked for the hidden Mickey on the giant globe and also found the cabinet in the sitting area with drawers labeled with Mickey, Minnie, Donald, Daisy, Goofy and Huey. We decided to relax in the room for the rest of the evening, making good use of the whirlpool. Kelli slept in and I decided to hit Hollywood Studios. As I passed the dock for the boat to the studios I decided to walk it. This was a mistake. The boat easily beat me there and the strong morning sun and humidity made it a sweaty walk. Along the way I did see some guys fishing from a docked boat. A Little Blue Heron was perched above then atop the canopy hoping for scraps. 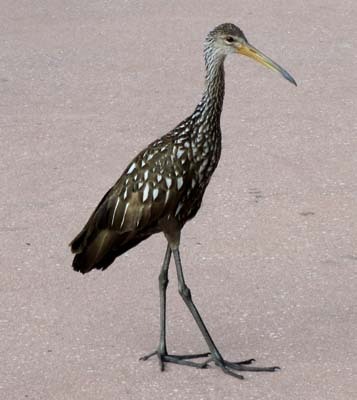 I found two Limpkins, odd birds that resemble something between a rail and a crane, on the path near the Dolphin Resort. The park had open by the time I got there. CMs were handing out cardboard Olafs, the snowman from Frozen. I decided to pick one up as a souvenir on the way out. 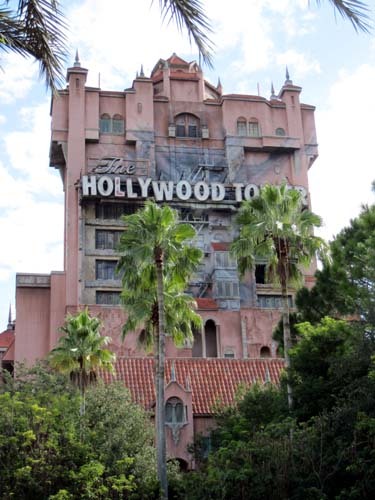 My first ride was The Twilight Zone Tower of Terror. 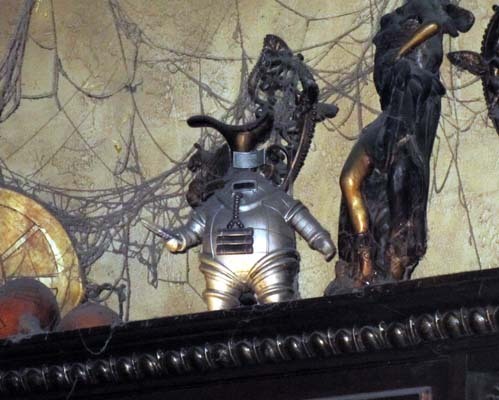 In April I had briefly seen an artifact on the high shelving in the room where Rod Serling introduces you to the ride. It looks like a fat man or creature in a spacesuit. I got a better look at it and realized it was from a favorite Twilight Zone episode called “The Invaders”. Spoiler alert! It was a story of an old woman alone in a rustic cabin. After hearing a strange noise above her kitchen roof, she is accosted by small intruders, only about 6 inches high, that came from a miniature flying saucer that has landed on her roof. She battles them, finally killing one and following the other back to the ship, which she proceeds to attack with a hatchet. From within the craft, she hears the intruder frantically warning other potential visitors that the people on the planet are giants and impossible to defeat. On the outside of the flying saucer you see the markings U.S. Air Force Space Probe 1. 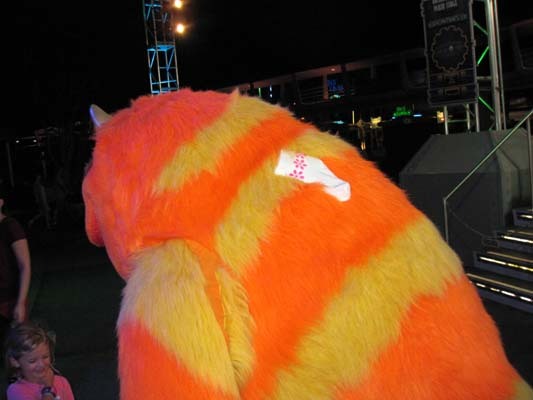 This is a great example of why we like Disney; the attention to detail. Where else would you find a small object, high on a shelf, where tens of thousands pass by and never notice it, but it brings back a favorite memory of one Twilight Zone fan. I headed over to Rock 'n' Roller Coaster Starring Aerosmith. The single rider line was not open so I waited 30 minutes in the standby queue only to find they had opened it when the lines all met. After checking the Little Mermaid shop for a special item for a little mermaid back home I headed to the Frozen area. I checked out the Wandering Oaken’s Trading Post store then went next door to the Frozen Funland. 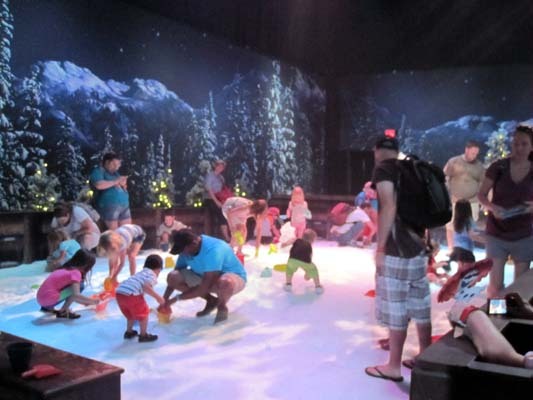 Here you can rent skates and ice skate, or build a snowman. 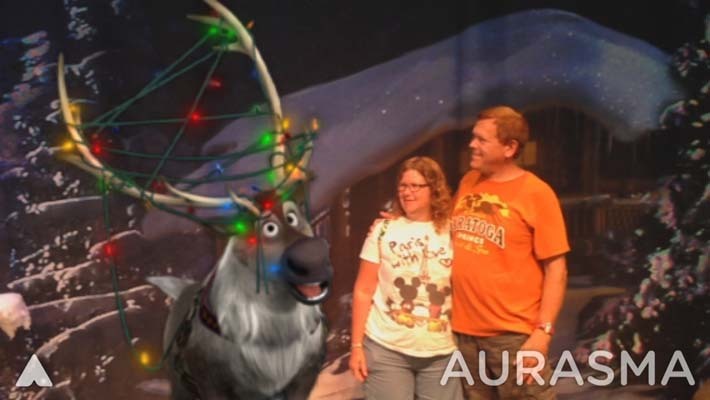 You can also get a photopass picture with an animated Anna and Elsa, or use the backdrops and the cool Aurasma App to get pictures on your own phone with Sven, Olaf or the Trolls. I planned to get Kelli back here tomorrow. I took a Star Wars Tour and stopped in the queue to get video of the baggage security droid. He can be really funny. I headed out of the park to join Kelli. As I passed by Storm-a-long Bay I noticed it was closed and asked a CM about it. She would only say there was an incident and that it would be closed all day. I found Kelli relaxing on the balcony. She had gone down to the quiet pool at the villas and had it practically to herself. She did say she shared it for a while with a mallard. After a while a number of people seem to come all at once (from Storm-a-long). The pool wasn’t crowded, but there were enough people that she decided to head upstairs. We had leftovers for lunch from a meal on Sunday, and headed out to the Character Warehouse Disney Outlet store up I-4 on International Dr. We have not been to this location. Parking was very difficult and we had to park in the back. Luckily it was a short walk to the store. They had some good deals on a few items, but clothing was never in our size. We headed straight back since we had an early dinner in the Magic Kingdom before the Halloween party. We dropped off our packages in the room, got ready for the night, and headed to the bus stops. This was the first time this trip in using the buses. We had a slight wait but the bus went directly to the park. We arrived at four and they again had the exit open for the entrance. It was nice not to have to go downhill to the water only to walk back up hill to security. 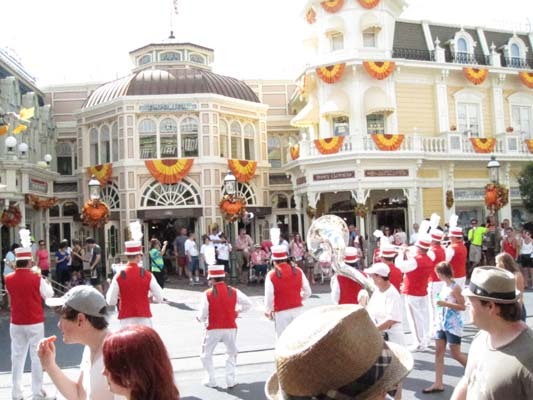 We stopped for a short while to watch and listen to the Main Street Philharmonic, a marching band that mixes tunes from classic Disney films with ragtime and swing. 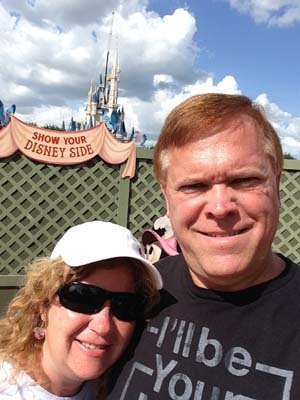 After a couple of selfies near the castle we checked in for dinner at the Liberty Tree Tavern. We had a bit of a wait in the hall before being seated. This family style dining featured a fresh salad with a Patriot's Platter to share and finished off with a Johnny Appleseed's Cake. The platter included roasted turkey breast, carved beef and sliced pork with mashed potatoes, vegetables, herb bread stuffing, and macaroni & cheese. It was all good comfort food well prepared. Kelli thought it was just OK. I think I am spoiling her with too many great restaurants, but for those you have to head to the resorts. This was a perfect restaurant to eat at before the party officially begins at 7 PM. 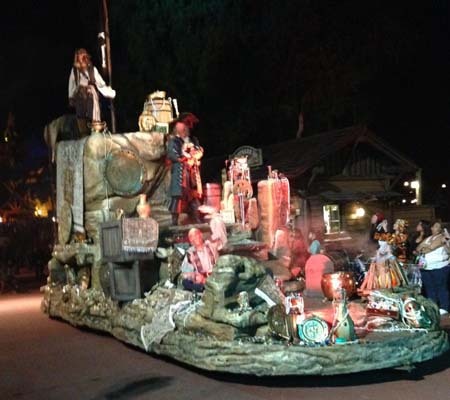 We made our way back down Main Street and saw the Move It! Shake It! Celebrate It! Street Party. 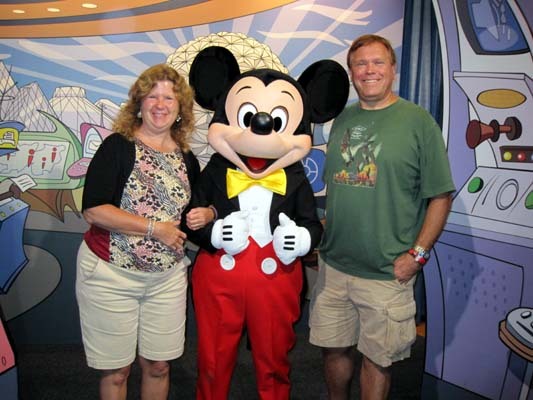 We had a fastpass to meet Mickey in the Town Square Theater where he will greet you by voice. We saw the Goofy statue on the bench outside so we first posed for some pictures. 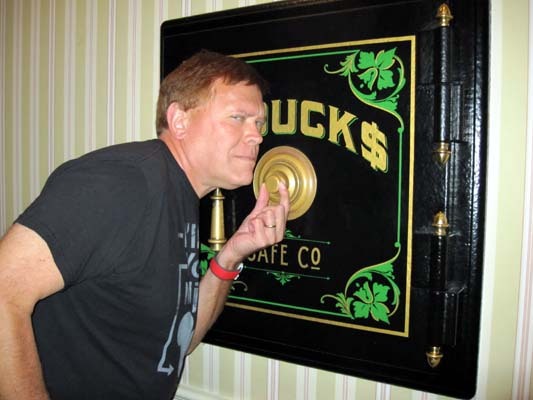 In the waiting area to see Mickey Kelli took a picture of me trying to break into Scrooge McDuck’s safe. Mickey talked and greeted us. He even blinked! We got some nice pictures with him. Kelli thought there was a slight delay in his speech. He was very cool to see and meet. The party had started so we put on our tails and hit some of the trick-or-treat trails for candy. We made our way around from Tomorrowland to Fantasyland. 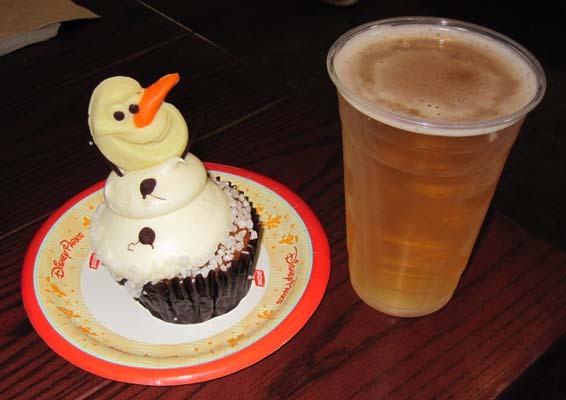 We stopped in Gaston’s Tavern for the special Ghost Cupcake. There was a huge line to see and take pictures with the seven dwarfs. We made our way past Liberty Square to secure a spot for the first parade. Many people had lined up already and we watched from the porch outside the Frontier Trading Post. It had started to lightly rain so it was nice to be under some cover. The Phineas & Ferb Creepa Crew had just come through so did not see them well. They were followed after a while by the Headless Horseman and I got some video of him. 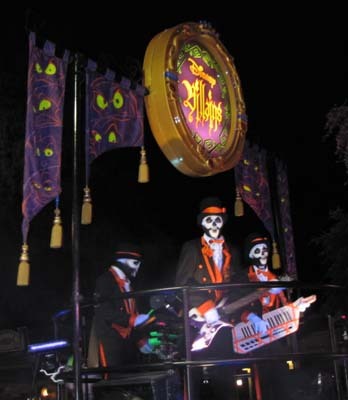 We then enjoyed Mickey’s “Boo-to-You” Halloween Parade but due to the rain the dancers were not doing their full numbers. 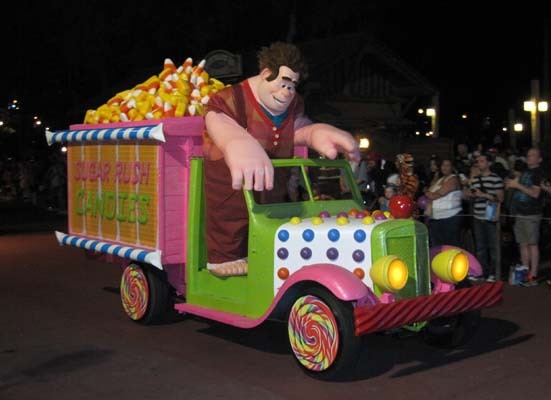 New to this year’s parade was Wreck-It Ralph and Vanellope. We quickly made our way to the hub; hoping not to run into a crowd like we did in April for wishes. 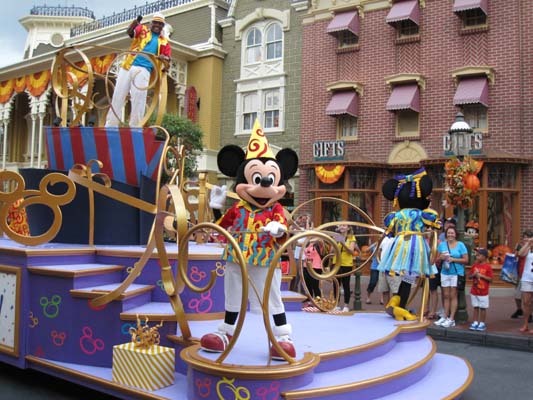 It was not a problem and we were able to enter onto the roadway of the hub since the parade circles the far side. 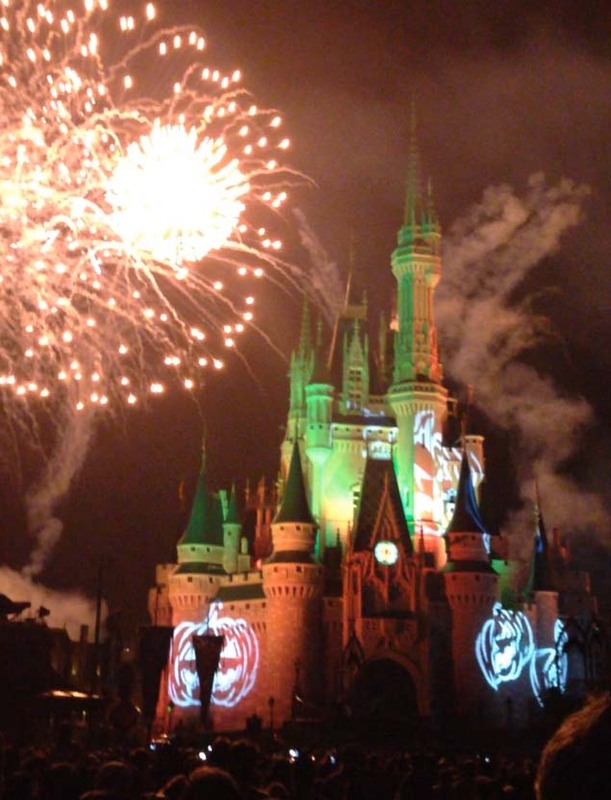 Perfect spot for the Celebrate the Magic - Halloween edition! - castle projection show. The rains had let up. This show never disappoints. 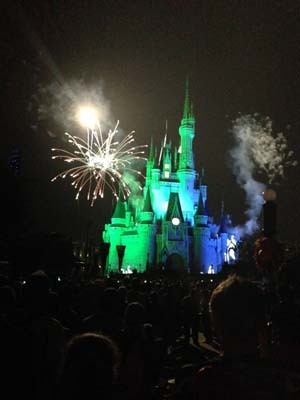 Happy HalloWishes Fireworks started shortly thereafter. 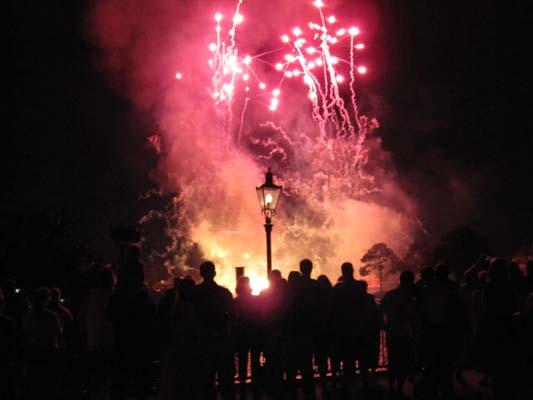 We loved the great spooky songs, Halloween fireworks and a spectacular ending surrounding the park and lighting up the night sky. 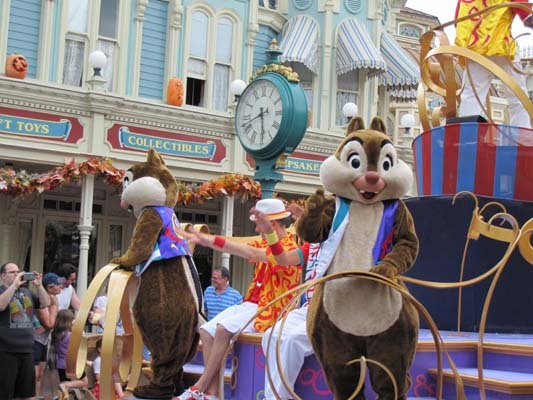 We wanted to see the second parade so we headed back somewhere around the Country Bears. We had a front row spot with some lighting onto the parade route. This aided for some great pictures later. The crowd is definitely lighter for the second parade. We got to see Phineas & Ferb Creepa Crew do their full show right in front of us. At one point the crowd was asked to come out and dance with them. We stayed put. 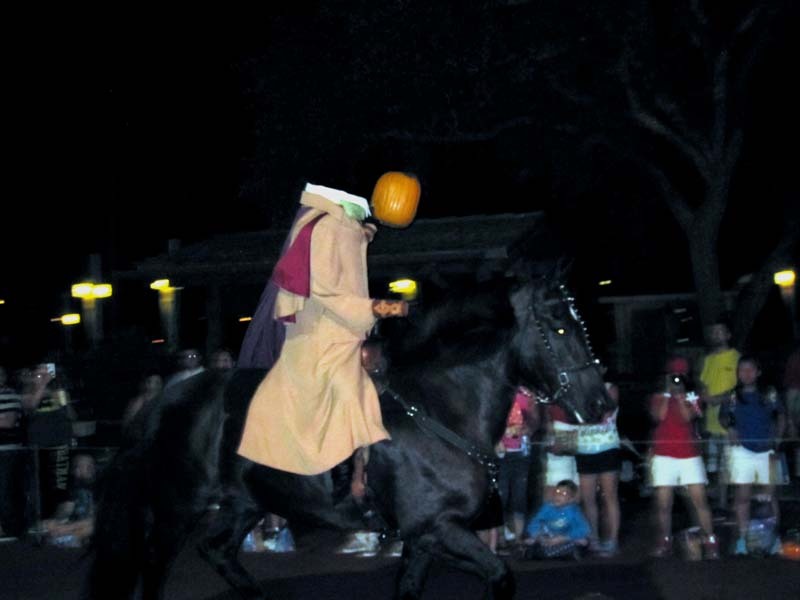 We again saw the headless horseman, but in better light followed by the parade. 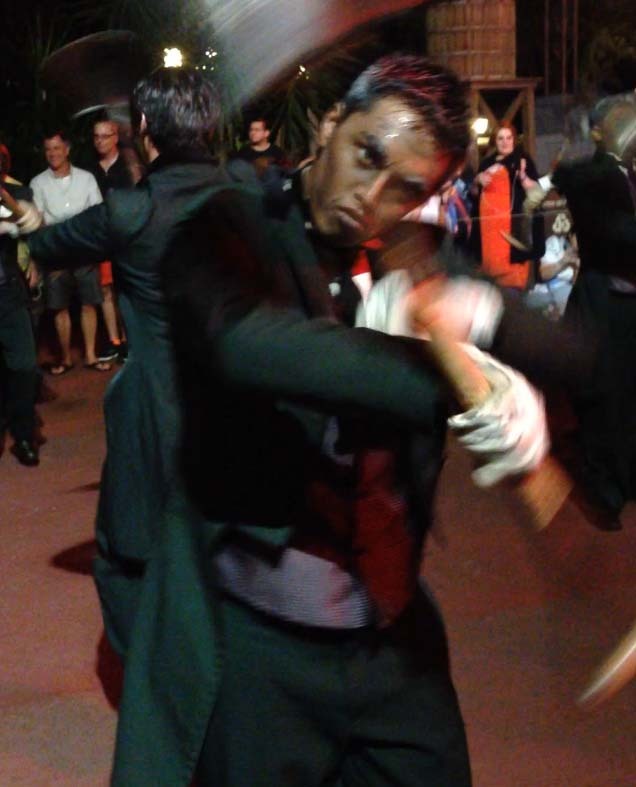 The streets had dried and the dancers did their full numbers; highlight of course were the dancing grave diggers with sparks flying from their shovels. After the parade we stopped for bathrooms then headed to Adventureland for some more trick or treating. On line to go into Tortunga Tavern for candy a little boy kept playing with my tail. I did not mind as his giggling and his family’s reaction was worth it. We made our way around the park. Our candy bags were getting heavy. 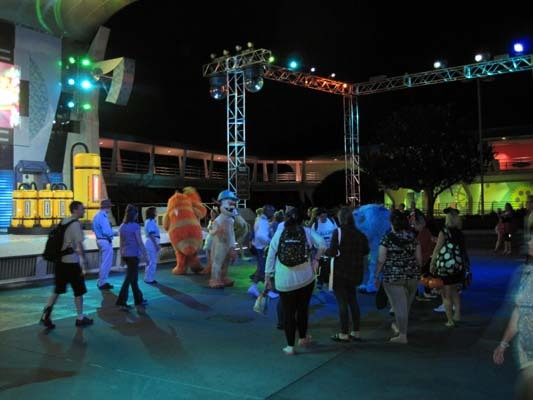 One last thing I wanted to do was check out the Monstrous Scream-o-ween Ball at the Rockettower Plaza Stage in Tomorrowland. 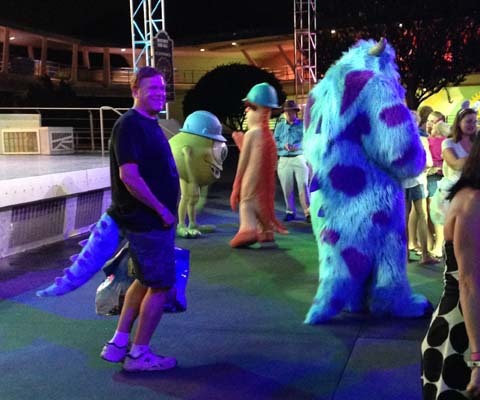 Sulley, Mike, George Sanderson, Needleman were dancing with the crowd. I was tired but the music was good so I danced the best my weary legs could. 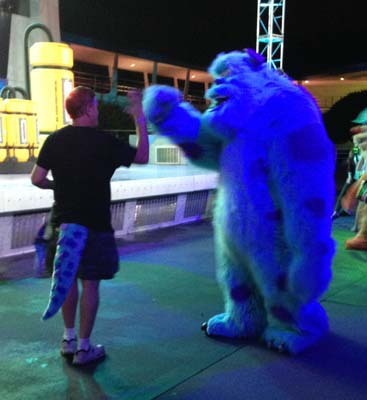 Sulley saw my matching tail and we did a fist bump. George had a sock stuck to his fur. We left tired but happy. A bus was waiting for us and it was great to sit down for our ride back. After another relaxing breakfast on the balcony we headed to Hollywood Studios by boat. 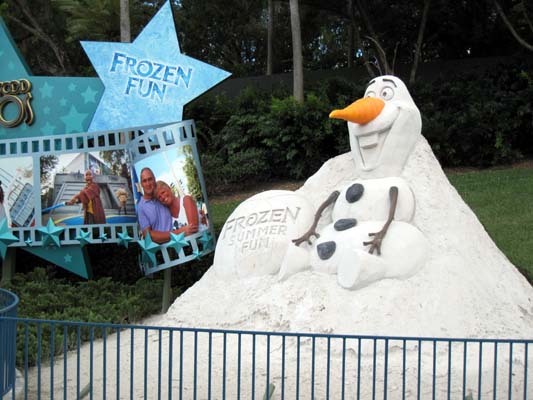 There is now a sculpture of Olaf out front. After rechecking the mermaid store for an item; we went into the Voyage of the Little Mermaid. We used our fastpasses but it made no difference since both queues went directly into the waiting room. 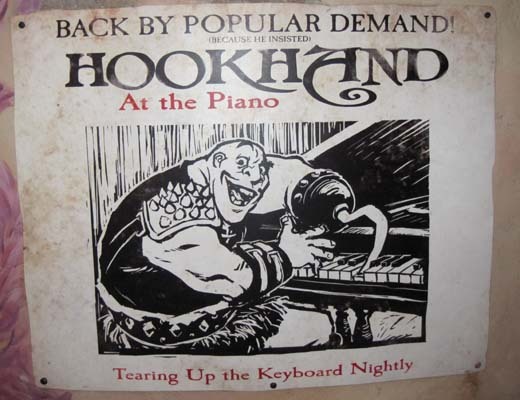 This show is a mixture of live action, singing and black light puppetry and is very well done. The Little Mermaid had a great voice. 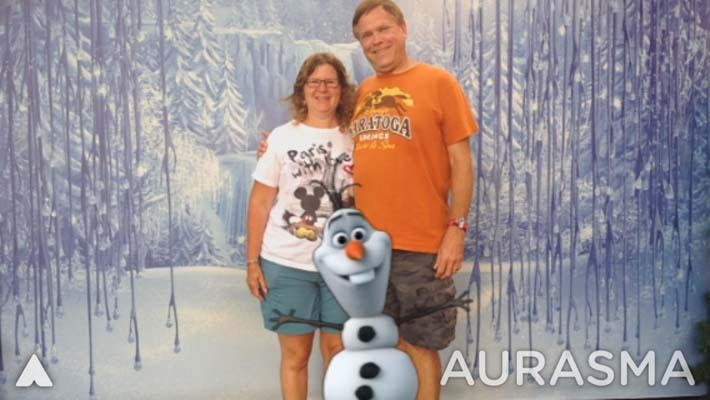 We made our way to Frozen Funland and took Aurasma phone photos with the Trolls, Sven, then outside with Olaf. Cast members were nearby to help take the photos. We also did the magic shot with Elsa and Anna with the photopass photographer. Then we shopped in the Wandering Oaken’s Trading Post. Along the Streets of America we tried taking some photos. I posed in front of Youse Guys Moichendise but I just don’t look like a wise guy. We barely made the next showing of Muppet Vision 3D, missing nearly all of the preshow. We back tracked to Toy Story with both of us getting good scores. We wanted lunch so I suggested the Backlot Express, but as we passed the Great Movie Ride decided to do that first. There was a bit of a wait but made the next tram when they needed two more people to fill it. We had the gangster version and we both enjoyed all the famous movie clips at the end. We headed out and took the boat back to the resort. I made arrangements on the phone to get picked up at the airport tomorrow from a local place, Peltown Taxi. It was the first time trying them, fingers crossed. We then spent more time down in the quiet pool till it was time to get ready for dinner. 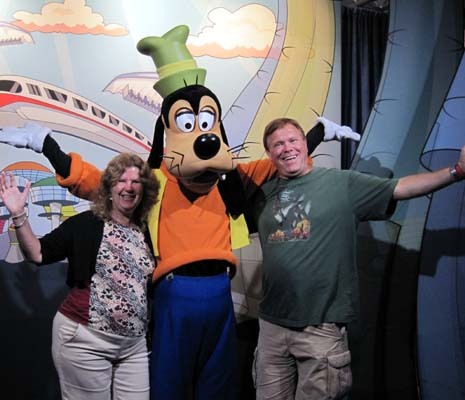 We took the bus to the Magic Kingdom and hopped on board the resort monorail. Dinner tonight was at a new restaurant for us, Narcoossee’s at Disney's Grand Floridian. I did not realize that Narcoossee’s is not in the main building. After getting some directions from a friendly CM we walked across the sparsely vegetated, manicured grounds to the restaurant on the water. 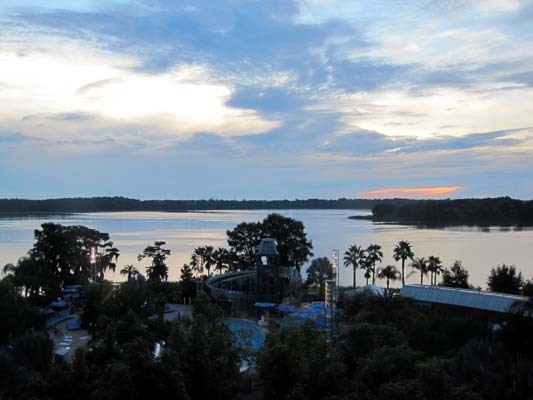 We had a short wait on the deck overlooking Seven Seas Lagoon. We sat on the first table inside. 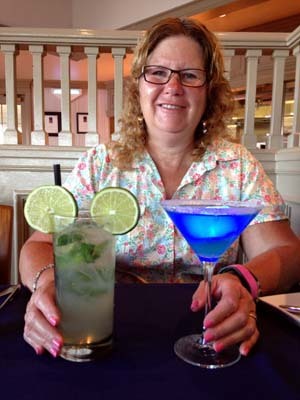 Drinks were a Bacardi Mojito for me and a Blue “Glow-tini” for Kelli, citrus vodka, peach schnapps, blue curacao, and a pineapple juice. I ordered the Maine Lobster Bisque and ask for two spoons so that we could share. They brought out two partially filled bowls. The bisque was excellent. Kelli ordered the chicken, pan-roasted breast with potato-artichoke risotto, baby mustard greens, tomatoes, sweet pepper pickles, and cilantro water. I had the pork rib chop, with white polenta with cheddar, pole beans, pickled garlic, and bourbon-peach conserve. It was a great meal to finish off our trip. 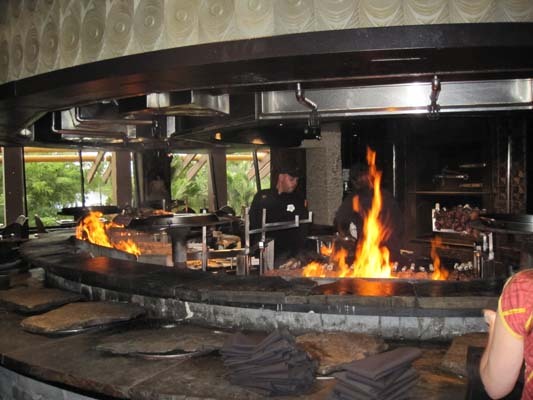 We gave Narcoossee’s four stars. After dinner we decide to head over to Epcot to see IllumiNations. We hopped on the resort monorail and transferred at the Ticket and Transportation Center for Epcot. I was surprised on how many people were heading in at 8 PM. We shopped in the stores in Showcase Plaza and the United Kingdom and then waited on the bridge over to France for IllumiNations. The wind was gently blowing in our direction so at the end we started feeling ashes, with some larger pieces of exploded fireworks falling from the sky. It was an easy exit and walk to our room where we relaxed out on the balcony with some Mike’s hard raspberry lemonade and did laundry in the room. This is the first time I am going back with all clean clothes. We packed our checked luggage, and then used the whirlpool bath one last time. The 6:30 alarm came too soon. I made the last of the English muffins, saving one buttered one for friends in the creek below us. We enjoyed breakfast out on the balcony and headed down to the Resort Airline Check In to check our bag and receive our boarding passes for our flight on JetBlue back to New York. Kelli and I then changed into our swimsuits for one last swim in an empty pool. After an hour we headed back up where I was able to quickly dry our bathing suits in the dryer and finish packing our carry-ons. We said good-bye to the room but we had one more thing to do. At the creek next to the pool heading out to the parking lot we threw out some of the buttered English muffins to feed a few turtles. I was surprised on how many showed up. 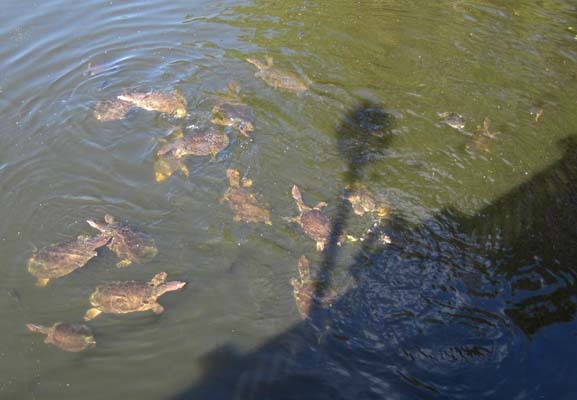 I counted a high of 27; most of them were large Florida Softshell Turtles. We gassed up at the Hess Station near the Boardwalk Resort and headed to the airport. We shopped in the Universal Studios store and grabbed some sandwiches for lunch. Our flight was delayed after we left the gate and sat on the tarmac for 30 minutes. After that our flight went smoothly and after getting our checked bag called Peltown to let them know we were ready. They told us where outside the terminal to wait and our driver showed up in about 15 minutes. It was nearing rush hour and I was kind of glad we did not burden a friend or relative to pick us up at this time. Taxi ride back to Mount Vernon from JFK Airport was $86 not including tip. Finding the Twilight Zone memorabilia from “The Invaders”.